China is one of the closest allies of the ruling junta in Burma, but so far it has not made any public comment about the protests there. Traditionally, Beijing says that it does not comment on - or interfere in - other countries' internal affairs. But China will be concerned about two things: the stability of Burma and the image of China. 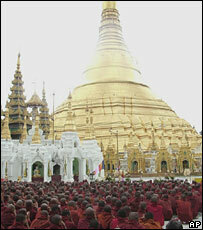 A stable Burma is important for China, as it is a corridor to the Indian Ocean and also a valuable trading partner. China wants to keep it that way. So instability or even war in Burma is not in China's interest. But neither is a bloody crackdown, because China is worried about its own image in the run up to next year's Beijing Olympic Games. And a Beijing-backed crackdown in Burma would spoil China's idea of a trouble-free Olympics. China always insists that it has no role in deciding how its trading partners run their countries. But over the last year the Chinese government has shown some willingness to engage in dialogue with some of its more controversial allies. Earlier this year, here in Beijing, China brokered a deal to persuade North Korea to give up its nuclear ambitions. It has also agreed to allow an international force to be sent into Darfur - and is sending along some peacekeepers of its own. But human rights campaigners say that China still refuses to use its huge economic leverage to persuade countries like these to adopt real change.